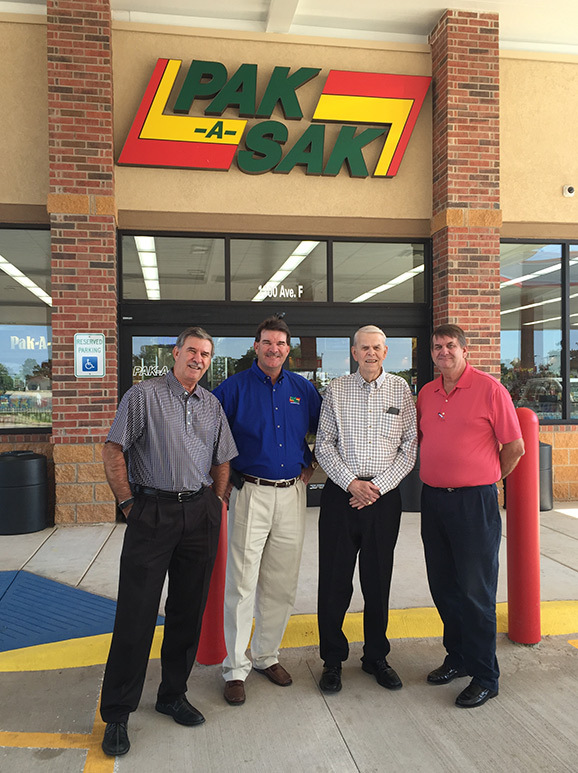 In 1978 Dale and Joyce McKee opened the first Pak-A-Sak convenience store in Canyon, TX. Over the years the Pak-A-Sak chain has grown to include 21 different locations all throughout the Texas Panhandle and it continues to be family owned and operated. At present, the chain is led by Dale and Joyce’s three sons Terry, Gary and Brian. Members of the third generation have also been involved in running the business for the past several years. The family attributes the business’ growth and continued success to their excellent employees as well there excellent customers. We are committed to being engaged in the communities we operate in by community involvement and philanthropic giving. Pak-A-Sak got into the drive-thru business in 2008. Now half of their stores have them. In 2010, Pak-A-Sak bought two primarily drive-thru Starbucks locations and turned them into Pak-A-Sak Expresses. The new definition of convenience is the drive-thru. My family stops in every time we travel to and from Albuquerque because I have to have the coconut teas the staff’s always friendly and the stores are always clean. The Pak a Sak on Gem Lake has such wonderful staff…..we go in multiple times a day and my son knows everyone by name. He invited the staff to his music program next week and Debbie the manager said she would be there!!!! That means so much to him and us……thank you for being so wonderful!!!!! I have been with this company for many years, and have been fortunate enough to know the owners personally. It is hard to believe that in such a cut-throat business as retail, that over the many years Pak has stayed so personally involved in their people’s lives. My father was hired to be a manager of a store when he was a few years younger than I am now, and Mr. Dale McKee told him that if he put his family first and Pak second that he would be a successful business man. And here we are, a family team, running this store over 20 years later. The owners are one-of-kind in this business, in that they believe in family as well as hard work. The regular customers become family to us. And turn-over rate on employees is almost none. The newest employee at our store has been here for over 2 years. Pak treats people well, pays better than what I went to college for, and is creates a safe environment in their stores. For that I am grateful.